My printer is nearly 20 years old. It cost me $2,000, so I could have the ultra modern 600 dpi output I needed to — get this — print out “high res” galleys to glue onto boards and hand to a professional printer. It. Is. Sloooow. Also, it only prints in black ink and jams frequently. Our color printer is my mom’s hand-me-down, which, for reasons I don’t understand, must be hooked up to her old computer and works only intermittently and never, ever when my kids need to print out something colorful for their homework. My fax machine was born during the Clinton administration — the first one. When you fax something, it returns the favor by shooting out a piece of paper to inform you of what you’ve just sent. I’m not sure what I’m supposed to do with that. My scanner appears to be unplugged, but I can’t find the end of it. My copier has been on life support for a year. So you can imagine how thrilled I was when I was offered an all-in-one Brother printer/fax/scanner/copier, and a wifi one at that. With three laptops and a desktop in this house, well, you can imagine that this new machine was greeted with a Christmas morning kind of feel. “It’s done already?” my 13-year-old asked. He hadn’t even had a chance to ensconse himself in my home office’s rocking chair to stare out the window while he waited. Maybe it’s time to send my 20-year-old printer to an assisted living facility. Lucky for you, the people at Brother are offering up one of these goodies to one lucky winner here at MommaSaid. 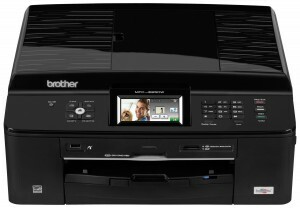 The Brother MFC-J825DW compact machine that scans, faxes, copies and prints. The unit offers built-in 2-sided (duplex) printing, easy-to-setup wireless connectivity for simple sharing, a 3.3” TouchScreen Color LCD display for easy navigation. Users can also print directly on to CD/DVD’s/Blu-ray™ discs. The MFC-J825DW allows access to FACEBOOK™, PICASA Web Albums™, FLICKR®, GOOGLE DOCS™ and Evernote® accounts directly from the machine via the Web Connect TouchScreen. Users can also print from a mobile device via: Google Cloud Print™ and Brother™ iPrint&Scan. Retail value: $149.99. Friday, October 28, 2011 at 8 p.m. ET. 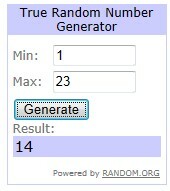 One winner will be selected at random by Random.org. I would use it to print recipes, coupons, coloing pages for my youngest son. It would be handy for homework for our middle school sons, being as we do have to google mst of their homework to even try to “help” them. I am sure all 3 of my guys will make endless Christmas lists. I also cannot rule out the slight possibility of finding a few pics of them photocopying their behinds too. The possibilities could be infinite. As a homeschooling mom, I would use this printer everyday. From printing out spelling words, coloring sheets and even recipes, this would be a very useful all in one printer. I can not tell a lie it would be me. I have 2 beautiful children a 9 year old boy and a 3 month old baby girl. My son is busy with soccer and the baby gets cutier everyday and I am following every move with the camera. I love to print and share pictures our family is spread out all over from Mexico to Alaska. My husband has been begging me to get a new printer (for his school papers), we need one bad! Ours sounds like it’s about to explode every time we use it. Please pick me! I’d love this printer! I often print out coloring pages for my son (so he’d love it too!) I print coupons frequently! And I like to be able to scan (old photos and the sort) along with my sons art projects, so they’ll always be preserved! I would use it most for printing and scanning pictures i do alot of scrapbooking. Also for printing out my sons homework and projects. my sister would love this. She’s in toastmasters, and since she’s one of the officers, she has to do a lot of coordination, which includes printing certificates, etc. She also volunteers a lot so there’s the volunteer forms, directions, etc. My college age daughter could really use. She has to print lots of double sided things for her coursework. I would use this printer the most for printing coupons, scanning my pictures and printing recipes for the holiday’s. Without a doubt, my husband (who is a self proclaimed computer geek) would use the printer the most. He loves electronics and can always help the kids when they need to use this kind of equipment. I, on the other hand, do not do well with these home office items. All in all, my husband and two kids would get much use out of it…okay, I’ll admit it, I would use it too….and maybe,,,,,,just maybe, I’ll like it!!! It would be used by me mostly for picture scanning and printing. Also for my kiddo’s homework and school projects. My husband would also be using it when he works form home. It would be an awesome replacement for our current one that never seems to be working when we need it and can never be “found” on our network! I would be so appreciative to win this printer. Our old printer broke over a year ago and I have not been able to buy another one. This would get so much use! My childrens’ school has gone paperless and we have to print out EVERYTHING, even lunch menus. I am tired of asking my friends “would you mind printing me out a copy of this or that?” My oldest is beginning to do reports at school and we have no way to print any of them out at home. I would love to be able to print out educational worksheets for the little ones again! I just want a working printer. It is so frustrating. It would be a dream to fax from home and the copy feature would be awesome as well for school and other uses. We just had our 4th baby so lots of pictures too. Thank you so much for your consideration. A new one would be used by all 5 of us. OK, honestly, 4 out of 5, my husband rarely uses it, unless it’s to unjamb the current one or figure out why someone’s homework won’t appear from it…..at 11pm….when it’s due the next day. 3 kiddos with homework, a mom with a coupon & recipe fetish, and a dad who occasionally prints things like…..homework or a coupon for his kids or wife. 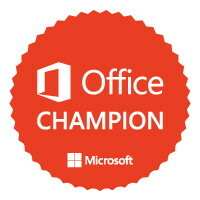 Thanks for the opportunity….and your time…reading this ridiculously long post. I could really use this printer for printing out invoices for my customer and mailing product information. I have found a new love for buying and selling online and this would be gr8. I would use it to print out postage and labels for shipping! I would love to make a scrap book of picture of my family for the holidays. I would also the fax machine so i can stop the trips to office max. I just really would be grateful if I won this, my family really needs it! My husband and I are both major printer/scanner users, but with two laptops, we’re constantly plugging and unplugging. Annoying! A wi-fi one make life so much easier. I would use this printer the most for printer coupons and making copies of important papers. Thanks for the chance. My husband would use this. He could scan pictures that the kids have colored and make a book. A great way to keep the paper mess to a minimum. Wow! I’d love to have this printer! We homeschool and the creative juices flow all day long! We’d be printing everything from photo story boards of history to worksheets and Christmas how-tos. Our life tends to rely on the printer for printing our family made newspaper that goes out monthly to family and friends, as well as, printing artwork made on the computer for lapbooks and science presentations. Come to think of it, our printer is an extension of our homeschool, so much that we’ve replaced it before we’ve replaced a faulty dvd player. I would love this multi functional printer for my own school work, I’m unemployed and going to school, so a new printer, though greatly needed, is simply not in the budget. My kids would absolutely love this printer for all of their school presentations. I have a 10th grader and 7th grader and they are constantly using the printer, almost on a daily basis. Our current printer gets quite the workout, but, it’s not multi functional like this one. It would put to great use. I’m in need of a new printer/copier since I wore out my last one 1.5 yrs ago. I really enjoyed having my own printer & used it for everything; I made birthday cards, Valentine’s cards, created party invites, thank you’s, and printed a ton of pictures since I have a little girl & both sets of grandparents live out of state. I especially love the wireless feature on this machine & the fact you can print from a mobile device. I think that it would be a very close tie for who would use this printer the most. I am in school for Dental Assisting and we have papers that we have to do. Then there are my kids who also have homework they need to do. On top of our school work, I love to print out recipes I find and articles. The kids love to print out lyrics to their favorite songs so they can sing along. We could really use this because our printer is on it’s last legs. We never know if we will actually be able to get something to print. so crossing our fingers that we get picked.